This lovely postcard, titled "Mournful Ukulele," is heading to a Postcrosser in Brazil, and features Shag (aka Josh Agle) artwork. 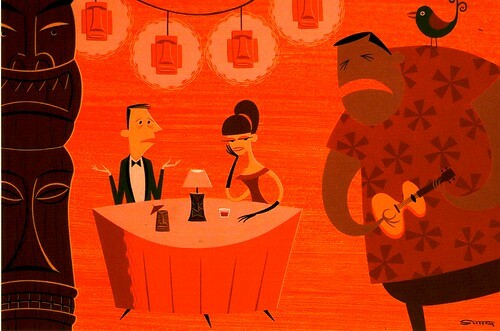 This is from the Shag Postcard book made by Chronicle Books. I'm not posting my mail stats right now, but I will mention that I'm a little proud of myself because this is my 50th sent postcard for the month of April. Whoa, Nellie! 50? :D CongratsA I'm still allowed only 5. 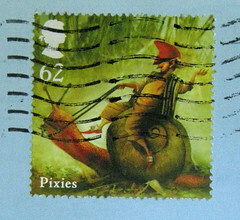 Limner - the 50th postcard I have sent this month to anyone, not the 50th postcard I've sent through Postcrossing. Nice job :) I am slowly getting back into the swing of things myself and the hubby is thanking your post of mail organizer for making his bday shopping for me easy, lol. That is a pretty cool postcard. I might need to try to order a couple.